All-new movies and applet added July 2012! Cacajao, the saki monkey, is a South American or New World monkey. South American monkeys or platyrrhines comprise one of the two infraorders (Platyrrhini and Catarrhini) of anthropoid primates. They live exclusively in South and Central America, but their fossil distribution includes the Greater Antilles (MacPhee and Horovitz, 2002). The fossil record of platyrrhines extends back to the Deseadan or late Oligocene of Bolivia where they are represented by the genus Branisella (Takai and Anaya, 1996). 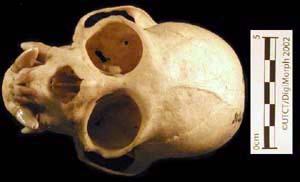 Their presence in the New World is generally considered to be the result of a single dispersal event (Fleagle, 1999) near the end of the Eocene from the Old World, where all known basal anthropoids are found (Beard, 2002). Because South America was not connected with North America or Africa at the time, this dispersal must have involved rafting across some portion of the Atlantic. Cacajao melanocephalus and C. calvus, the black-bearded and bald Uakaris are the largest species of the Pithecinae, a subfamily that includes this genus, Pithecia, and Chiropotes. They exhibit slight sexual dimorphism, males and females averaging 3,160g and 2,710g respectively in C. melanocephalus, and 3,450g and 2,880g respectively in C. calvus (Fleagle, 1999). Uakaris live in flooded forests where they subsist on a diet that includes fruits with hard outer coverings, which they open with their distinctive tusk-like canines. 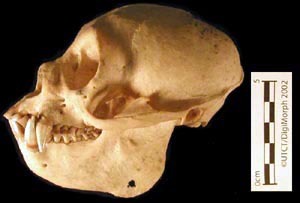 This male specimen, the skull of an adult (all dentition in place), was obtained from the National Zoological Park on 8 June 1955. 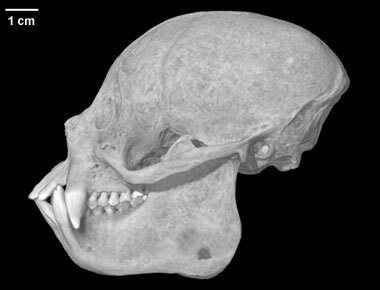 It was made available to The University of Texas High-Resolution X-ray CT Facility for scanning by Dr. James Rossie of Stony Brook University, courtesy of the Smithsonian Institution Division of Mammals. Scanning was funded by an NSF dissertation improvement grant to Mr. Rossie (#0100825). Funding for image processing was provided by a National Science Foundation Digital Libraries Initiative grant to Dr. Timothy Rowe of The University of Texas at Austin. This specimen was scanned by Matthew Colbert on 9 July 2002 along the coronal axis for a total of 489 slices. Each slice is 0.2003 mm thick, with an interslice spacing of 0.2003 mm and a field of reconstruction of 87.0 mm. To cite this page: Dr. James Rossie, 2002, "Cacajao calvus" (On-line), Digital Morphology. Accessed April 19, 2019 at http://digimorph.org/specimens/Cacajao_calvus/302626/.